Thank you for visiting the Riverside Baptist Church website! Our Sunday School classes start at 10:00am on Sunday mornings and the Worship Service with preaching starts at 11am. The church phone number is 252-330-2790, and Pastor Jason is usually in the office M, W, Th, Fri from 10am-1pm. The church email is riversidebaptist@centurylink.net. 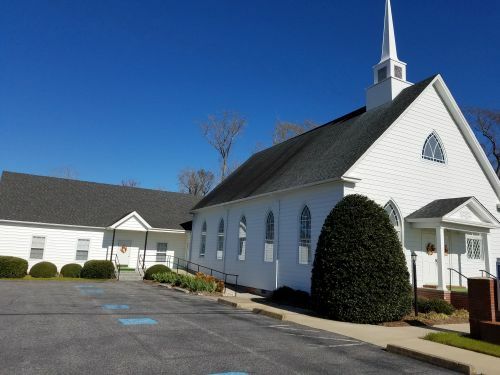 Riverside is a Southern Baptist Church, part of the Chowan Baptist Association, conservative but casual. You can read more about our beliefs and what is required to be a Christian and go to Heaven under the About Us link. On the 2nd Sunday of every month, our ladies' missions group, Circle of Friends, meets in the fellowship hall at 5:30pm. On the 3rd Sundays our Baptist Men's group meets for breakfast at 9am. Please join us. Like Us on Facebook and stay up to date with the latest Riverside News.